Barring weather delays, I should be on a morning flight home from Chicago to San Francisco today and back in St. Helena, Calif., in time for Thanksgiving dinner. I traveled to the Windy City this week to visit with Jim Schultz of Geremarie, the Lake Zurich, Ill.-based billet parts fabrication powerhouse and ultra-sophisticated high-performance Factory Billet engine program housed therein. You might see a business trip that ends with flying 2,000 miles on Thanksgiving day as less than something to be grateful for, but for me nothing could be farther from the truth. Chicago is the final stop—unless something special comes up—in a remarkable year of travel covering the high-performance powerboat world that has taken me to Florida four times, as well as New York, North Carolina, Tennessee, Wisconsin and—of all places—Sweden. 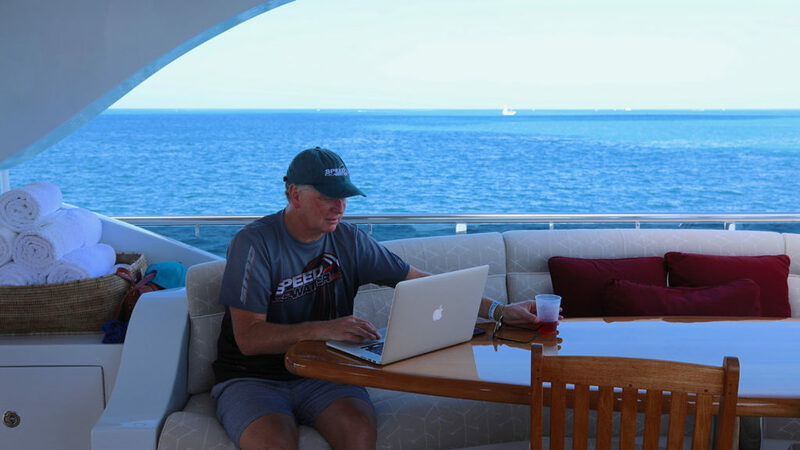 A 200-foot yacht served as a worthy office for the author during the final day of the SBI Key West Offshore World Championships. Photo by Bob Barnhart. Those are just the work trips I remember right now, and I’m grateful for every one of them. Don’t get me wrong, the process of travel these days, especially air travel, isn’t much fun. But once I’m where I need to be and can settle into whatever story I’m exploring or event I’m covering, I’m in heaven. Take the adventure before this Chicago trip, meaning spending six days in Key West, Fla., covering the Super Boat International Offshore World Championships and Florida Powerboat Club Poker Run. Not only did my fellow offshoreonly.com/speedonthewater.com colleague Jason Johnson and I get to report all the action, we were able to get it done from two yachts—one measuring 200 feet—and a hotel suite overlooking Key West Harbor and the final turn of the SBI racecourse. Who wouldn’t be grateful for that opportunity? Or the chance to spend 12 days in Sweden covering two poker runs and making lifelong friends? Or spending a day at Mercury Marine’s Lake X facility near Orlando, Fla., for an advance look at the company’s new generation of V-8 outboards? Or enjoying dinner with go-fast boating legend Reggie Fountain, Jr., and Iconic Marine Group chief operating office Joe Curran in Washington, N.C., the night before Fountain’s second round of attempts to break the current V-bottom kilometer speed record? Of course, there are deeply personal things—getting to say goodbye to my mom a few days before she died in February chief among them—I’m grateful for this year. There also are industry-related things—no one died participating in a poker run, for example—I’m grateful for this year. But most of all, I’m grateful for my partner, Rebecca, my adult children Alex and Anna Rose, Rebecca’s 15-year-old pistol of a daughter named Samantha, my brother and sister and nieces and nephews and all of those people I’m blessed to call friends. I hope I’m home this afternoon, a generous glass of something single-malt and delicious in hand, by the time you get around to reading this. I hope this day finds you surrounded by the people who love and appreciate you. You are my readers, and while I do write for profit—the more the merrier, I say—I really write for you. And for that, my friends, I’m not just grateful today. I’m grateful every day.